Points West Living Wetaskiwin is still undergoing final touches before opening in August, but we already know what residents and visitors will see when they enter the building for the first time. General Manager Tamara Thomas has chosen the pencil drawing she will hang in the main entrance – once the construction dust has settled. "Picture brought tears to my eyes"
Tamara knew right away she wanted the drawing but in a much larger size. So, after clearing the decision through the PWL home office, she was able to contact and meet the artist Joan Fitzner. Joan is a Saskatchewan born artist who also works as an educational assistant at Wetaskiwin Regional Public Schools. She is represented by Dalcon Visual Arts in Wetaskiwin. Tamara arranged to have the print enlarged to several times the original shown with Joan in the photo above. A 36" x 48" print of Not Forgotten will be displayed in the entrance of PWL Wetaskiwin when it opens in August. 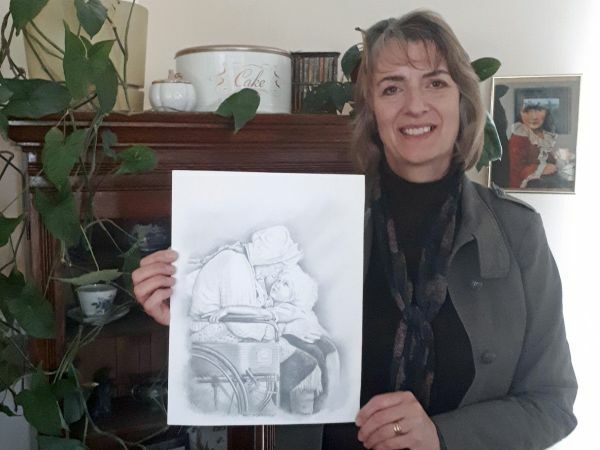 Photo: Wetaskiwin artist Joan Fitzner with the original of her pencil sketch, ‘Not Forgotten’. An enlarged version of that sketch will hang in the reception area of the new PWL Wetaskiwin when it opens in August.